I hope you are having a good week! Today my dear friend Barbara has stopped by to visit. You may remember her from visits she's made in the past - telling the rescue story of Zeus the cat, and introducing her pet family: Oz the dachshund, Zeus the cat, and guinea pigs Radar and Magenta. 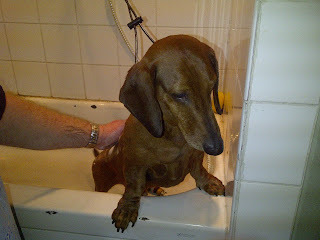 Today Barbara is back to remember two very special dachshunds. Abby: Thanks for stopping by! What pets would you like to remember at my blog today? Billy - Red, smooth standard dachshund. August 9, 2002 - January 8, 2014. 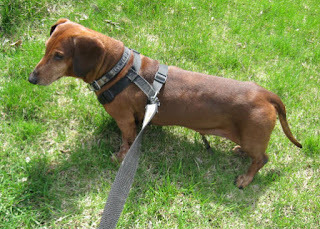 Senior Auggie, just before his 10th birthday. 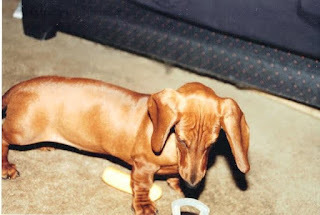 Barbara: Auggie was our first dog and our love (some call it obsession) of dachshunds started with him. He loved to walk when HE wanted to do so. But when he didn't, my husband said it was like taking the family brick for a walk. Auggie had the best singing voice. We would do our aroooos and he would join in, only ten times louder. He would throw his head back and sing to the skies. Auggie was very much the family protector and never fell asleep at night until he went room to room and made sure the family was safe and sound. Auggie was a special dog and he touched my heart in such an incredible way. Billy came to us at age 2 1/2. He had been a former show dog/breeding dog that was looking for his forever family. Billy was the best traveller. We took him with us all over southern Ontario while our son participated in martial arts training and tournaments. Billy loved the beach, but hated the water. He loved to walk in the sand, but always stayed at least a foot or more from the water's edge. He was incredibly loyal and loving and I miss him every day. Barbara: Auggie did not like it when I talked on the telephone. He often took the opportunity to get into mischief in order to get the attention away from my phone call. One day I was talking on the kitchen phone and he came into the room with this long piece of foam in his mouth. My first thought was that we didn't own anything like that. I ended my call, took the foam from him and went to investigate. Sure enough, there was a long tear in the base of the sofa and Auggie had managed to remove the foam and bring the evidence right to me. Puppy Auggie standing in front of the very sofa from which he removed the foam in the story. Auggie suffered from a serious bout of IVDD when he was about six years old. He gained back about 85 % of his mobility, but was no longer able to jump or support his weight on just his back legs. One day, in a hurry and running late as usual, I set some grocery bags on the chair in the living room. I went back out to the car to get the remainder of the shopping. When I came back in the door, I heard some commotion from the living room. I rounded the corner to find Auggie shaking a bag of kielbasa sausage from the deli and eating it as it flew into the air. One would never guess that this dog had an disability. And, he clearly had managed to find a way to hoist his body onto the chair to get the wonderfully smelling sandwich meat! 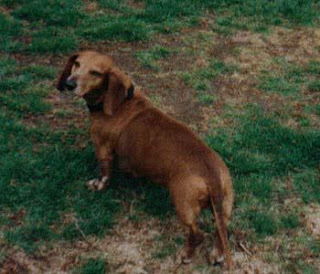 Billy was our most athletic dachshund. When we first brought him home, he actually jumped a child gate that we had blocking off the bedroom area. We realized then that Billy was likely to get into things that we were not anticipating. His first Christmas with us we were hosting the family for dinner. We had a small house and the extra table brought it into the living room. I had set it with all of the non perishable food items and condiments. I went to get something else from the kitchen and I heard some noise coming from the dining area. At the same time our guests we staring to arrive. I went to check on the noise and found Billy happily investigating the pickle platter on the dining room table. I am not sure how he jumped up on the table, but I managed to remove the disgruntled dog just before the family entered the room. Billy had an obsession with pinecones. Our neighbourhood had many trees that gave him plenty to choose from. There was one in particular that dropped long, skinny pinecones onto the sidewalk. Every time we walked by that house, Billy spent a few minutes choosing one. He carried it home with him and held it in his mouth until we traded it for a biscuit. Whenever I see a pinecone on the ground I am reminded of my beloved Billy. Abby: I enjoyed visiting with you today. Is there anything else about your pet you would like to share? Barbara: Auggie was our very first dog, and he taught me so much about love and the human-animal bond. When we lost him, I feared I could never love another dog. But, then Billy bounded into our lives and brought with him this amazing energy and spirit. He was looking for and needed a family. He taught me that my heart is large and can hold a place for many pets Our bond was different than the one I had with Auggie, but both are special and the memories of each are to be treasured. 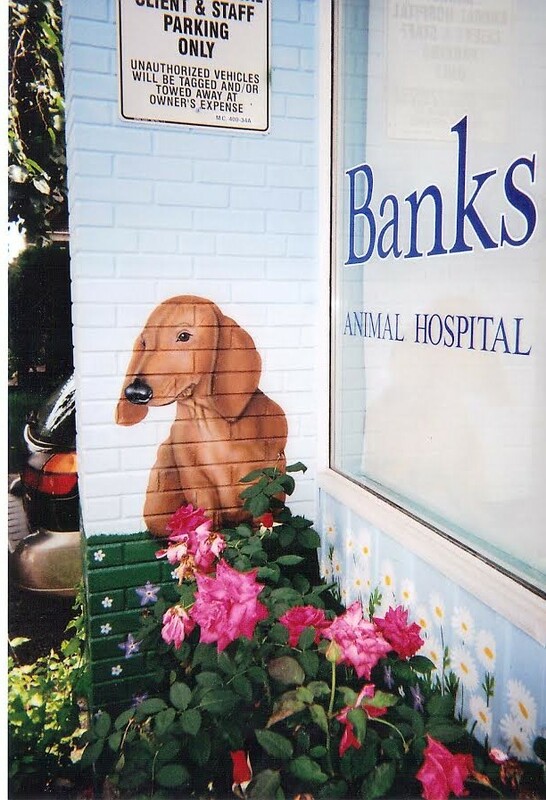 Auggie as part of a mural at Banks Animal Hospital in Toronto. During the time I worked there an artist was commissioned to paint the mural. She asked all staff to bring photos of pets, past & present. Auggie had already left us, so I chose this photo as a remembrance of him. 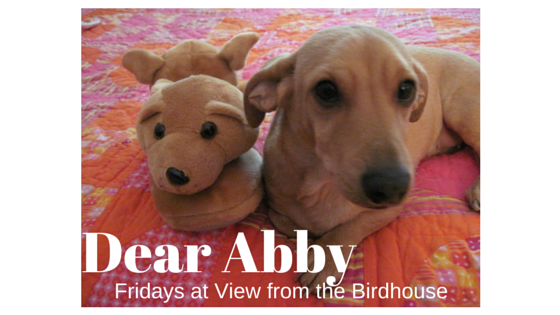 Abby: Barbara, thank you so much for visiting! I really loved hearing more about Auggie and Billy. I can just imagine Auggie and his sofa adventure ... and Billy and the pickle platter! I also loved hearing about Billy and his pinecones. Those are some great stories. Their photos are beautiful too. Friends, if you would like to leave a comment or question for Barbara, you can do so in the comments section, below. Thanks for visiting - and hoping you have a good upcoming week. I loved reading about Auggie and Billy. 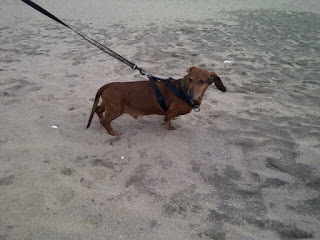 I don't have pets, but if I did I would love to have a dachshund. Pets are great, they become members of the family and provide us with many memories. 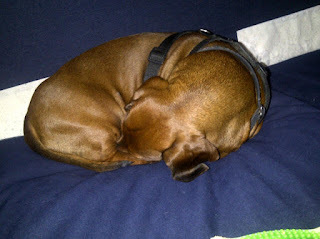 I had a friend that had a dachshund, he was sweet. Aw, this was a nice read. I never grew up with pets, but my husband's family has a golden retriever and I've suddenly become a dog person. I hope when we have kids of our own, we also get a dog! Abby, thank you so much for sharing my memories of Auggie & Billy. And thank you also to everyone for your kind comments. I have been enjoying reading this series and am so grateful to be included. Our memories illustrate the power of the human-animal bond and it is so heartwarming to know this bond lasts forever. I loved reading these precious memories. I have such fond memories of some of the pets that I grew up with during my childhood. I've always had Dachshunds! What cuties... they really are the best dogs. Both sound like they were amazing members of the family. Thank you for sharing your sweet anecdotes of their lives. Those are so cute! What adorable loving pets, I've heard they are really great companions for older people. Awe this one reminds me of a dog we had for a little while. He was a good pet but we had to give him to a friend because our bigger dog wasn't too friendly to him. Barbara, thank you again for visiting! Your stories of Auggie and Billy touched a lot of lives. Dear friends, thank you so much for visiting! I loved reading all your comments. I love reading about your babies, Barbara. Thank you for sharing your memories of Auggie and Billy. They were two special boys.